Every last Tuesday in January, the capital of Scotland’s Shetland Islands turns into an epic scene right out of Game of Thrones. The annual fire spectacle with thousands of men dressed in Viking costumes goes by the name Up Helly Aa. Hordes of bawling men and raging flames fill the streets across the islands. 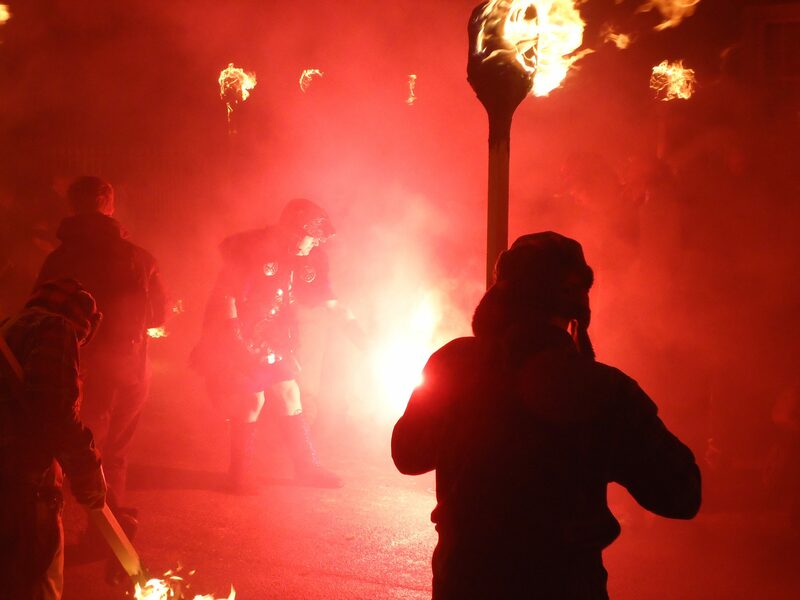 While all fire processions on Shetland during those times can be summed up under the same name, the one in Lerwick is the biggest and most famous. 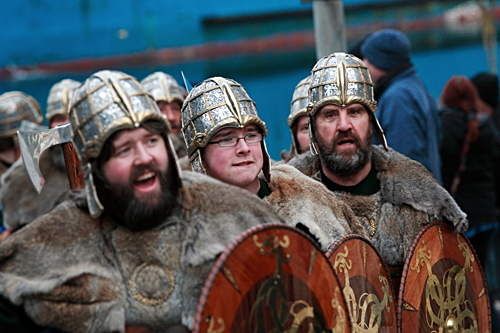 On Up Helly Aa, Shetland locals dedicate a full day to dressing up, drinking and partying – similar to the Rhenish Carnival Monday in Germany. For a whole day, public life pretty much comes to a halt throughout Lerwick. Officials even declared the following Wednesday a public holiday in a wise sense. The entire celebration revolves around the so-called Guizer Jarl and his 60 men entourage, the Jarl squad. Guizer Jarl is a Shetland citizen who earns the role of the Viking chieftain for his efforts in the organization of the festival. 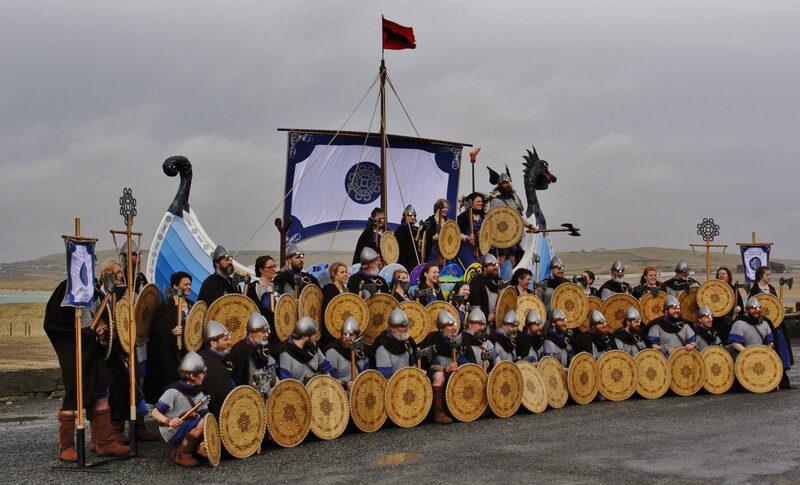 Several months prior to the festival, the Viking enthusiasts start spending most of their leisure time on creating the masterpiece for Up Helly Aa. 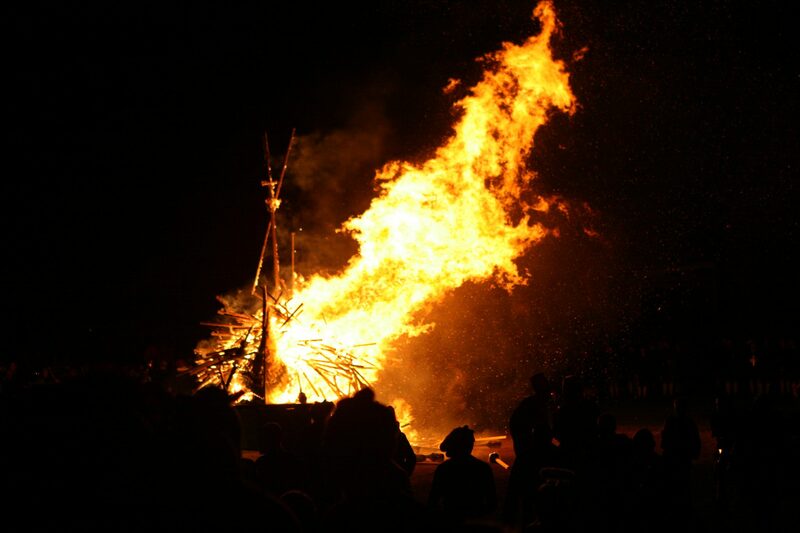 Right from the start, it is clear that the grand Viking longboat will be sacrificed on the day of the fire spectacular. On the morning of the 24th day after Christmas the adventurously dressed men of the Jarl entourage appear in the center of town. At this point it is finally revealed, which heroic figure of the Nordic legends will be incarnated by the Jarl. As soon as the sun has set, the city’s street lanterns are turned off. With the illumination of a signal rocket on the night sky, the celebrations begin. Equipped with burning torches, the Viking impersonators pull the grand Viking boat to its final destination. 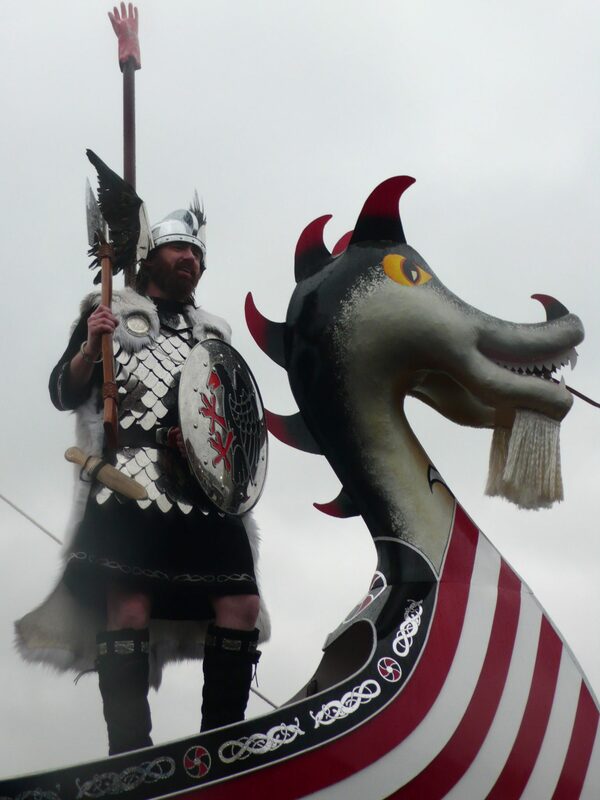 On top is the throning Jarl who commonly mocks the city council as the parade moves though Lerwick’s streets. The half-hour procession march is accompanied by the music of the “Lerwick Brass Band” and “Lerwick Pipe Band”. Let The Viking Boat Burn! Upon arrival at the destined location, the Jarl squad throws all the torches onto the wooden boat. At the same time, the crowd strikes up the old song „The Norseman’s Home“ while watching the flaming inferno. The entire procedure of lighting up the boat is based on an original Viking ritual. In the “Nordic funeral”, Viking chieftains were burnt together with their boats after they had passed away. After the cremation, the spectators flock to the many pubs and dancehalls to keep celebrating until the early morning hours. The hundreds of Viking enthusiasts split up into smaller groups going from pub to pub. To fire up the parties, they mix with the people, perform funny sketches and encourage everybody to join their dancing. An Original Procession Of The Vikings? In reality, the tradition of the festival probably only dates back to the 19th century. The city archivist of Lerwick found out that the name of Up Helly Aa appeared for the first time in 1870. A rather young event after all. At that time, rivaling groups of young men were rolling burning barrels of tar through the streets of Lerwick. Thus, it rather started as an uproar than a festive celebration. Only later on, the city was able to civilize the happens by introducing the Viking theme and turning it into a public event. 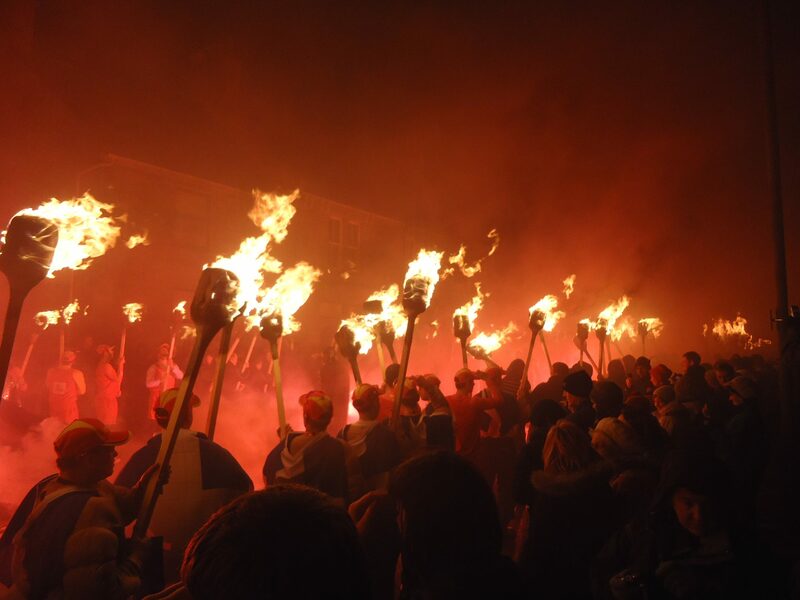 The next Up Helly Aa 2019 takes place on Tuesday, January 29 2019.